Whilethe number of confirmed extrasolar planets is now approaching 300, the tally ofextrasolar moons so far identified is still a rather disappointing zero. Planetsbeyond our solar system are incredibly challenging to find. Moons are nearlyimpossible with today's technology, given that they are generally expected tobe quite small compared to their parent worlds. EvenEarth?s moon is invisible on the famous "paleblue dot" image obtained by Voyager 1 from the comparatively smalldistance of 3.7 billion miles ? a photograph taken from well within our solarsystem. Butthe search is not impossible, says Darren Williams, associate professor ofphysics and astronomy at Penn State Erie, the Behrend College. Williams believesa moon in orbit around a known extrasolar planet will also be detectable if welook hard enough with the right techniques. "Itwill add a periodic component to the combined infrared signal" of theplanet-moon system, he said. Findingmoons is more than just an academic quest to count them up. Planetarysatellites can be highly interesting in their own right. It'spossible, for example, that lifecould exist on extrasolar moons, researchers say. And it has been suggested that theocean tides inducedby Earth?s moon may have been necessary to create the conditionsfor life on our planet to begin. At the least, the evolution of life hasbeen affected by our moon's constant tugging. "We certainly owe our presentclimate stability to the Moon and its stabilizing influence on the spin axis, but I'm not convinced that big moons are a requirement for simple or advanced life," Williams said. "I do think that Earth would have evolved advance lifeeven with greater seasonal extremes, but it may have taken a different evolutionary path." 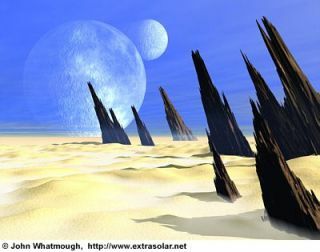 Williamshas modelled an Earth-like planet with moons of varying sizes and concludedthat satellites as small as Earth's moon could be detectable in the infrareddata, owing to their large surface temperature variations. By studying anextrasolar planet and building up a picture of that world?s infrared output,any sizable moons present should be detectable in this way. Sofar, however, no planet as small as Earth has been detected around anotherstar. But astronomers expect that barrier to be broken soon. Future missions,such as NASA's Terrestrial Planet Finder and The European Space Agency's Darwin,will have the ability to return the valuable data required both for findingother Earths and, Williams figures, some moons. "Thepresent goal is to build instruments capable of seeing something as large asthe Earth or possibly Mars. Smaller Mercury- or Titan-sized objects fall belowthat first-order threshold," Williams said. Socould these missions cut to the chase and spot an extrasolar moon directly? "Theymight, if the light collectors are big enough and if the moons are big enough.It will be easier to see moons that happen to transit the face of a star, suchas what the space telescope Keplerwill attempt to do starting next year," Williams explained. The space-basedKepler observatory will note dips in starlight caused by planets crossing infront of stars. If the planets are aligned in such a favourable manner, thenthinking goes, moons ought to transit the stars too. Asimilar conclusion is reached by Szab?, Szatm?ry, Div?ki and Simon in a paperpublished in Astronomy and Astrophysics in 2005. They conclude that theKepler mission should identify a few extrasolar moons using this method ofdetection. Yeteven if we are not lucky enough to catch an extrasolar moon in transit, thesefuture space-based planet hunters will be able to do the observationalgroundwork, in visible light and in the infrared, needed to search forsatellites. Theseplanet finders will even be capable of detecting the glint of starlightreflecting off any oceans of liquid water an extrasolar planet may harbor. "Wateris extremely dark in the infrared except when the light reflects from thesurface at a glancing angle," Williams told SPACE.com. Thisglint will be most apparent when the planet is in a crescent phase, when thestarlight hits the reflective surface at an oblique angle. (Mercury and Venus,as seen from Earth, go through phases similar to our moon. Observations ofother planets around distant stars will undergo phasing, too.) Observing suchreflections can help map the planet?s thermal output and infer the distributionof oceans and continents. Indeedthe MarsExpress spacecraft is set to observe crescent Earth's ocean reflection thissummer and in fall of 2009 to help understand the phenomenon.